Summary: Powerful NGOs such as Amnesty International have major political impacts, and often promote narrow agendas that are inconsistent with universal human rights. As part of NGO Monitor’s continuing assessment of this bias, we have systematically analyzed the relative emphasis on Israel in comparison to other countries in the Middle East in 2006. NGO Monitor has applied a quantitative framework to measure the financial and human resources devoted to addressing events and occurrences in these countries. (The same methodology was used to examine the agenda of Human Rights Watch.) This carefully documented research clearly demonstrates that in 2006, Amnesty International focused disproportionately on condemnations of Israel, far beyond any reasonable distribution of resources in a region marked by fundamental human rights abuses by many repressive regimes and sources of violence. 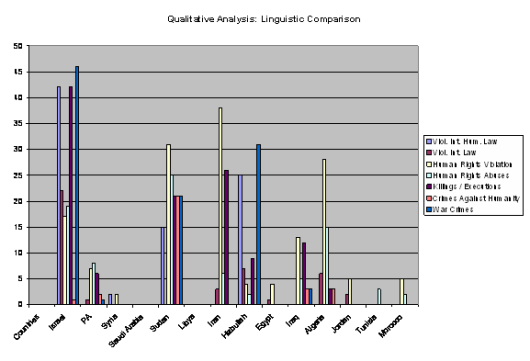 This study, which also includes a qualitative section focusing on the language used in reports, shows that Amnesty singled out Israel for condemnation to a far greater extent than Iran, Sudan, Saudi Arabia, Libya, Syria, Egypt, and other chronic abusers of human rights. This evidence of a clear political agenda is consistent with other studies and examples of Amnesty International’s bias and lack of credibility. Methodology: Amnesty International publishes six types of documents addressing human rights. Based on the relative resources required to produce each type of document, as well as its relative impact, NGO Monitor has developed a rating system by which to measure, assess, and compare each of these types of publications. Reports (10 points): Detailed documents describing events in depth and analyzing them in the context of international law. Reports may focus either on a specific country or on a particular topic. In the latter case, some of the reports analyze the behavior of a number of countries in the framework of international conventions. Open Letters (9 points): Detailed documents addressed to an influential body, such as the United Nations or European Union, with the aim of influencing policy, such as economic assistance, sanctions, or limits on trade cooperation. The Wire (8 points): Amnesty International’s monthly magazine, sent to subscribers and people involved in AI’s campaigns, featuring articles on events that are considered by Amnesty officials to be the worst cases of human rights violations. The articles are usually accompanied by color photographs and captions. There is also a small section at the end of updates about ongoing events or the resolution of tensions reported in earlier issues, as well as a list of Worldwide Appeals initiated by Amnesty International (these were not included in the sum of documents for each country – only feature articles were counted). In contrast to press releases, for example, which are written and published immediately, the articles featured in The Wire reflect greater investment of resources. Public Statements (7 points): A statement of Amnesty International’s official position in response to specific events. Press Releases (6 points): Only several paragraphs long, press releases announce newsworthy events and developments. 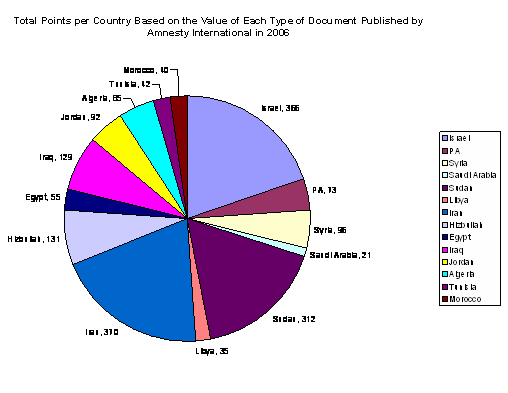 DATA FOR 2006: The following table reports the number of documents of each type that were published on several Middle Eastern countries by Amnesty International in 2006. The column labeled “total documents” reflects the sum of all documents produced about a certain country that year, while “total points” represents the numerical value assigned to each country based on the weighed point system. Certain documents were counted more than once when there were substantial passages in the same article dealing with more than one country. *Although the Palestinian Authority and Hezbollah are not considered by the international community as independent national entities (“countries”), these regimes play significant roles in the region and have therefore been included in this study. Only those articles dealing directly with Hezbollah, and not the Lebanese government, were included in the count for Hezbollah. **The six documents condemning the Multinational Force’s treatment of Iraqi detainees and their breach of international rules of war were not included in the sum of articles for Iraq, even though they appear under the Iraq section of Amnesty International’s online library, since they are directed mainly against the US and UK and not against the Iraqi government. 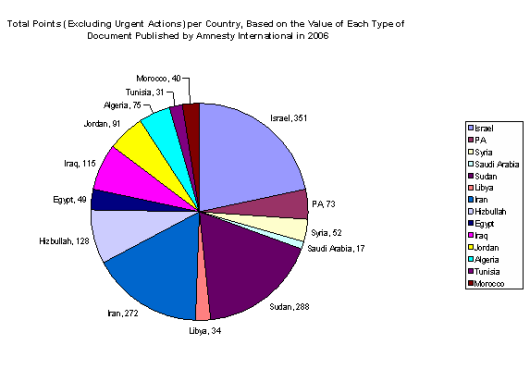 ANALYSIS OF AMNESTY INTERNATIONAL’S BIASED AGENDA: As demonstrated by the data above, in 2006, Amnesty International focused on Israel (63 documents) more than on any other Middle Eastern country, with the exception of Iran (133 documents). If Urgent Actions are removed from the analysis, the number for Iran drops to 35, which is lower than the 48 reports, open letters, Wire, public statements and press releases published about Israel. 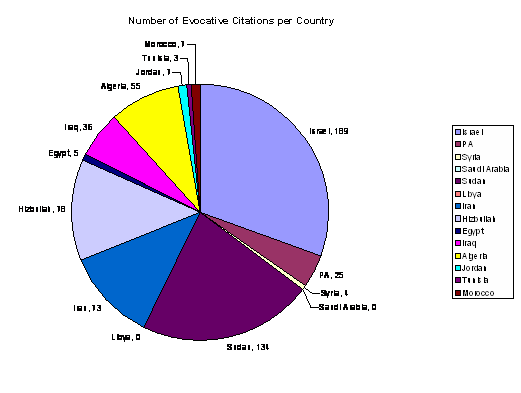 The number of publications devoted to Israel (excluding urgent actions) (48 documents) is significantly higher than other countries in the region: Hezbollah (17 documents), Iraq (15 documents), Jordan (11 documents), the Palestinian Authority (10 documents), Algeria (9 documents), Syria (7 documents), Egypt (7 documents), Morocco (5 documents), Libya (5 documents), Tunisia (4 documents), Saudi Arabia (2 documents). The number of documents (excluding urgent actions related to Israel (48) is even higher than the number of significant publications by Amnesty on Sudan (37). Thirty-seven of the 63 documents about Israel were published by Amnesty International after the outbreak of the 2006 Lebanon War. Thirty of these documents were related to the war and accused Israel of “disproportionate attacks”, “war crimes”, and “violations of international humanitarian law”. Of these thirty documents, twelve were exclusively focused on Israeli actions during the conflict. In contrast, Amnesty released only two documents (both published on the same date a month after the war) focused exclusively on Hezbollah’s actions. Amnesty issued no statements calling for the release of the kidnapped Israeli soldiers. The following graph shows the distribution of points across countries in the Middle East and their weight relative to one another. In terms of its relative value, Israel (366 points) ranks second only to Iran (370 points). However, when the Urgent Actions are excluded, the relative weight of Amnesty International’s focus on Israel (351 points) and on Iran (272 points) is reversed. It becomes apparent that, in 2006, Amnesty International devoted more of its resources to covering events involving Israel than those occurring in Iran. Moreover, the gap between the relative weight of Amnesty International’s focus on Israel and other countries in the Middle East increases significantly, particularly in relation to Syria (only 52 points). Since Urgent Actions usually deal with individuals at risk of mistreatment rather than with major events, it is reasonable to exclude this category for the purposes of this study. The following chart dramatically reveals the attention placed on Israel by Amnesty when the Urgent Actions are excluded. These statistics reveal Amnesty’s disproportionate attention to Israel, even while other, often more severe events take place elsewhere in the world, such as the murder of 400,000 people in Darfur or the four million killed in the conflict in Congo. A 2006 study on Amnesty’s reporting conducted by the Washington, D.C.-based Capital Research Center came to similar conclusions. In the study, CRC counted the number of news releases, reports, and urgent actions published by Amnesty International for selected countries and calculated the "reports per million citizens" for these countries. The results show that Amnesty focused on the United States at twice the average global rate, and on par with Saudi Arabia. Israel is the subject of the greatest number of Amnesty publications per million people with fifty-six times more reports per million than North Korea and twenty-five times more than Egypt. Methodology: In this section, we examine the nature of the terms and language used by Amnesty International in its reports. We note the number of times legalistic terms such as “violations of international humanitarian law”, “violations of human rights”, “international law violations”, “human rights abuses”, “unlawful killings”, “extra-judicial executions”, “crimes against humanity” and “war crimes” appear in publications about the different Middle Eastern countries. (Urgent Actions that warn of or announce the injustices committed against individuals or groups of individuals were excluded from this count and only those Urgent Actions addressing more far-reaching events were searched for evocative language.) In addition, such terms were only counted when they were used to directly describe or condemn the country’s actions and activities, in contrast to legal definitions or general statements of international policy. Similar conclusions were reached by Andres Ballesteros, Jorge Restrepo, Michael Spagat and Juan Vargas of the University of London and the Conflict Analysis Resource Center (CERAC), a Bogota-based conflict think tank. In their report, “The Work of Amnesty International and Human Rights Watch: Evidence from Colombia”, they state that Amnesty International follows a “non-systematic approach that includes opaque sourcing and frequent changes in the objects they measure.” Moreover, they list “failure to specify sources, unclear definitions, an erratic reporting template and a distorted portrayal of conflict dynamics” among the methodological problems with Amnesty International’s publications. Furthermore, the report accuses Amnesty International of “bias against the government relative to the guerrillas”. In the case of the Middle East, this tendency is manifested in Amnesty International’s favoring of Hezbollah and the Palestinian Authority over Israel. The CRC study also found that Amnesty, under the leadership of Irene Khan, has adopted “double standards on human rights, a leftist political agenda, an unrealistic view on armed conflict, and propaganda against America and Israel." The following section provides an analysis of select articles that confirm this unscientific, unstandardized application of the human rights discourse by Amnesty International in order to condemn Israel. The article blames the crisis in the Palestinian Authority on the European Union and the United States for withdrawing their funding after Hamas came to power in January 2006. The article ignores, however, rampant Palestinian corruption and that aid to the Palestinians has actually increased during this time. The article claims that Israel “as the occupying power,  is obliged under international law to ensure the welfare of the Palestinians living under its occupation.” The matter of whether the Palestinian Authority, and Gaza, in particular, is “occupied” is a matter of international legal dispute. Under Article 6 of the Fourth Geneva Convention on the Protection of Civilian Persons in Time of War, a foreign power is only considered an occupier "to the extent that such Power exercises the functions of government in such territory." Since 1995, and certainly since the disengagement, Gaza’s Palestinian population has been under Palestinian Authority jurisdiction. The article also accuses Israel of engaging in “excessive and disproportionate force against the Palestinian population” without providing a legal analysis for this statement. The article goes on to claim Israel is “appropriating large areas of fertile Palestinian land” without providing any sources for this allegation. The statement calls on the “international community” to “continue to press the PA to abide by international law and to act to prevent attacks by Palestinian armed groups against Israeli civilians” but fails to mention that the Palestinian Authority, as led by Hamas, refuses to accept the existence of Israel, to denounce the use of violence or terrorism, and has been involved in many of the attacks by “armed groups” that Amnesty mentions. The first paragraph states that the war erupted on July 12, 2006, failing to mention the cross-border attack by Hezbollah in which two Israeli soldiers were abducted and eight other soldiers were killed, as well as its launching of Katyusha rockets into Israel across the northern border. Instead, it begins with a statement that “hundreds of thousands of people – up to one quarter of Lebanon’s population – were forced from their homes by Israeli bombardments,” thereby erasing the context of the conflict. The article uses emotive language only in regards to Israel, accusing the Israeli military of “smash[ing] [Lebanese homes] to dust” and “rubble”, “pound[ing] buildings to the ground”, “bombard[ing]” villages, and “blow[ing] [roads, bridges, petrol stations] to bits”. In contrast, Hezbollah’s assault on Northern Israel, which also caused hundreds of thousands to flee their homes (a fact ignored in Amnesty’s statement), are merely called “attacks”. As has been the practice of many other NGOs including Human Rights Watch, in order to maximize the Lebanese casualty figure while diminishing the Israeli count, Amnesty conflates the numbers of civilian and Hezbollah dead (estimated at around 650) in its casualty figure of 1000, but only mentions the Israeli civilian dead in its casualty figure for Israel. Amnesty accuses Israel of targeting residential areas without mentioning Hezbollah’s systematic practice of operating from within civilian areas. As NGO Monitor has documented, many of Amnesty’s claims regarding the Lebanon War were false or severely lacking in credibility. It should also be noted that no statements or documents of any type were issued condemning Hezbollah for abducting two Israeli soldiers, despite Amnesty’s core mission of promoting freedom for political prisoners. In a July 13, 2006 Press Release, Malcolm Smart, Director of Amnesty International’s Middle East Program, calls for humane treatment for the soldiers and Red Cross access, but there is no call for their release. The illustrations above are but a very few examples of the biased perspective that dominated Amnesty International’s publications in 2006, leading to the dissemination of unbalanced and, at times, inaccurate information about the situation in the Middle East. NGO Monitor’s website provides numerous additional examples of Amnesty’s biased reporting on Israel. Conclusion: This research clearly demonstrates that in 2006, Amnesty International continued to promote a biased, anti-Israel political agenda, which exploited the language of human rights. Amnesty officials published more documents on Israel than on any other Middle Eastern country (with the partial exception of Iran), and included the evocative terminology of the Durban strategy in its treatment of Israel’s activities more frequently compared to other countries in the Middle East region. To read NGO Monitor’s report regarding Amnesty’s coverage of the Lebanon War, click here. Click here for "Justice Ministry’s rebuttal of Amnesty International’s report , ‘Enduring Occupation:Palestinians under Siege in the West Bank’ "
1. See “Under fire: Hezbollah’s attacks on Northern Israel” and a press release “Hezbollah’s deliberate attacks on Israeli civilians” (September 14, 2006). 2. 18 documents contained passages of significant length condemning both sides simultaneously (though not always in equal proportions). Therefore they were included in the counts for both countries (2+18 = 20 for Hezbollah, and 12+18 = 30 for Israel).